As a PETstock Rewards Member, you’ll earn $10 in PETstock Dollars for every $500 spent on thousands of products and services. Use them on anything you like, at any time you like. Look out for member only offers and opportunities to earn double or triple dollars! We want to reward you for taking such great care of your buddy. If you purchase any participating brand of premium food or flea, tick and worming treatment we’ll give you 15% Brand Cash back! Use this brand cash next time you shop the same brand on cat or dog products, wet or dry food, even when the product is on promotion – as long as it’s the same brand. Every time you purchase one of the participating premium foods, we’ll give you 15% back in Brand Cash to spend on the same brand next time you shop with us. The 15% is worked out on the price the item scans for – meaning we will reward you at the full price, not the price you pay after redeeming any Brand Cash, giving you even greater rewards. You can also redeem Brand Cash and earn Brand Cash in the one transition! You have three months to spend your premium food Brand Cash. Flea, tick and worming treatment Brand Cash expires three months after the month in which it was earned for three packs or six months after the month it was earned for six packs. 'PETstock' means PETstock NZ Limited 5721473 and includes where appropriate PETstock's employees, agents, and contractors, officers and related bodies corporate (as that term is defined in the Companies Act 1993. 'Members' means the members of PETstock Rewards and 'Member' means a person who has applied for membership and whose application has been accepted by PETstock. ‘PETstock Dollars’ refers to the amount of loyalty dollars earned with each Member transaction that are automatically accrued to the Member’s account. ‘PETstock Brand Cash’ refers to the amount of brand loyalty dollars earned with each Member transaction on participating brands, that are automatically accrued to the Member’s account. Membership is only available to individuals. Trusts, partnerships, joint ventures, associations, corporations or any other body corporate cannot apply. PETstock may accept or refuse an application for membership in its absolute discretion. If an applicant does not provide the necessary information on the Application Form, that applicant may not be eligible to participate in PETstock Rewards. Membership rights are determined by PETstock from time to time and may include discounts for products purchased at PETstock stores. Discounts only apply to the member noted on the application form and may not be used in conjunction or combination with any other offer or promotion. Member discounts are not available on goods at 'sale' or 'special' prices. It is the responsibility of the Member to maintain a valid postal address, email address and mobile phone number with PETstock to continue to receive Member benefits. By applying to PETstock Rewards, the applicant acknowledges and accepts the PETstock Rewards Membership terms and conditions. These terms and conditions are binding to an applicant upon the issue of approved Membership. Each Member consents and agrees to receive marketing information, offers and special discounts from PETstock. A Member may choose to opt out at any time by either unsubscribing from their notification using the tools provided in the sent communication, by contacting their store or PETstock Head Office on [email protected]. If requested, a Member must produce proof of membership if seeking the benefit of any discount or other benefit offered to Members, or upon request by PETstock. This is currently through provision of their membership number or appropriate form of identification such as a current drivers licence. Any liability arising out of or in any way connected with a Member's participation in PETstock Rewards is the responsibility of that Member. PETstock is not liable in any way whatsoever for any injury or loss (including any indirect or consequential loss) of any kind to person or property suffered by any Member whether by reason of any act or omission, deliberate or negligent, of PETstock in connection with PETstock Rewards, including injury or loss incurred whilst participating in any activity of PETstock Rewards or PETstock or in any activity in which Members are invited to participate. This condition is subject to any liability with may not be lawfully excluded, in which case such liability will be limited to the greatest extent permitted by law. All discounts for Members for purchases at PETstock stores are subject to availability. Member discounts are not negotiable, non-transferable, or redeemable for cash. PETstock makes no warranty or representation as to the quality, suitability or merchantability of any goods or services offered as prizes. PETstock shall not be liable in any way if benefits or promotions are unavailable as a result of a technical malfunction, operator fault, errors resulting from computer hardware or software errors or failure. Members indemnify PETstock for and against any loss or claim suffered or incurred by PETstock arising from or in connection with, a breach of these terms and conditions by a Member. PETstock Rewards, components of PETstock Rewards and its associated promotions may be amended or withdrawn by PETstock at any time without notice. PETstock does not warrant in any way that the discounts or benefits for Members will be available at any particular time or times or in any particular place. Customers must be a PETstock Rewards Member to qualify to earn PETstock Dollars. PETstock Dollars can be redeemed at any time in-store on all products excluding gift cards, pet adoption and microchipping. PETstock Dollars may be redeemed by the member immediately after they are earned. PETstock Dollars are non-transferable and cannot be redeemed for cash. PETstock Dollars earned on goods and subsequently returned or refunded will be cancelled. If a Member does not make a purchase for a period of three (3) months from the end of the month they make their last purchase, their PETstock Dollars will be divested and the balance reverts to zero. If a Member shops at PETstock at least once every three (3) months, (‘Remains Active’) PETstock Dollars will expire after twelve (12) months and their balance reverts to zero. PETstock Dollars are not earned when a member opts to Price Match. Any queries in regards to PETstock Dollars need to be submitted in writing to the PETstock Customer Experience Team at [email protected]. In case of dispute, PETstock's decision shall be final and binding. Members receive a maximum of one (1) free DIY dog wash at PETstock per calendar year. Members earn PETstock Dollars at a rate of three times the base (‘Triple Dollars’) for Puppy School class fees with PETStock Puppy School. Members earn PETstock Dollars at a rate of three times the base (‘Triple Dollars’) for Level One Obedience training with PETStock Puppy School. Members receive $20 off their very first PETstock VET consultation. They will also receive one (1) free annual nurse dental check and one (1) free nurse weight & nutrition check at a PETstock VET to a maximum of one (1) per member, per calendar year. Dental checks and Nutrition checks are only available at PETstock VET hospitals. Customers must be a PETstock Rewards Member to qualify for Brand Cash. Members will receive Brand Cash to the value of 15% of the scanned price of an individual brand of participating premium food and flea, tick and worm treatments, which will be automatically added to the Members PETstock Rewards account. Brand Cash is redeemable on the same brand and is not restricted by size, category or type of food i.e. dry and wet. 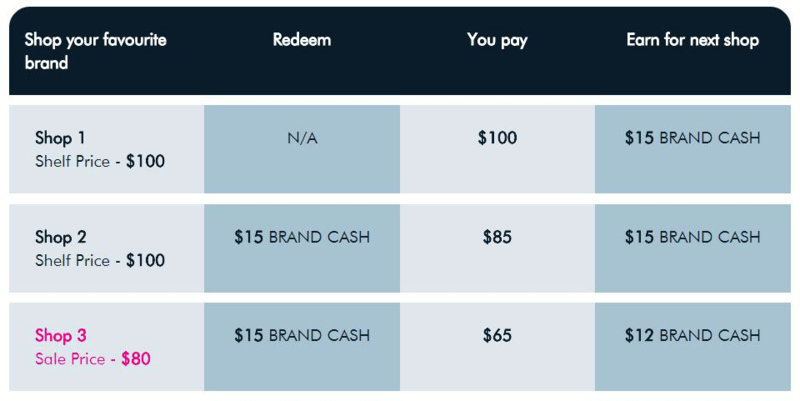 Brand Cash is not able to be redeemed on the same day that it is earned, but is redeemable 24 hours after the transaction in which it was earned. Brand Cash is not earned when a member opts to Price Match. 15% Brand Cash back is available on the following participating brands. Member rights are valid until terminated or cancelled by PETstock (in its absolute discretion) or until the Member notifies their nominated PETstock store that he or she wishes to terminate their Membership. PETstock may, in its absolute discretion and without giving reasons for its decision, at any time and without notice cancel any membership or substitute advertised discounts for any other item of a comparable value. A Member may terminate participation in PETstock Rewards by emailing the PETstock Customer Experience Team at [email protected] or by contacting their local store. registers and/or activates more than one account. PETstock reserves the right to vary these terms and conditions at any time for any reason and without notice to Members. For the avoidance of doubt, these terms and conditions supersede and replace any and all previous terms and conditions specifically governing PETstock Rewards (previously PETstock Family Values). Members participating in PETstock Rewards and its associated promotions are bound by these terms and conditions and are subject to any other conditions imposed by PETstock from time to time. Any questions regarding PETstock Rewards should be referred to your local PETstock store or by contacting the PETstock Customer Experience Team at [email protected]. We retain the right and discretion (but not the obligation) to edit, delete, reject or remove any comment which you post or seek to post in the comments areas. You grant us a non-exclusive, royalty-free, perpetual, worldwide licence to reproduce and deal with any material you submit to us by all means whatsoever (including, without limitation, in print and electronic format). PETstock NZ Limited 5721473 does not sell or lease personally identifying information (such as your name, address, telephone number, bank and credit card account numbers) to non- affiliated companies or entities. PETstock does record information regarding the purchases made by Members to help us provide you with special offers and other information. PETstock may use this information to provide you with personally tailored coupons, offers or other information. PETstock will send relevant offers and/or information from our preferred suppliers to our Members where we feel that information is of particular benefit or of interest to our Members. PETstock Rewards is our paw-some new Loyalty club! It’s our way of saying thanks for being a regular PETstock customer and letting us help you love your pets. PETstock Rewards is FREE to join and the rewards are fur-tastic! No complicated points system here, earn real rewards every day such as PETstock Dollars, Brand Cash and receive exclusive offers and up front benefits. Our rewards are better than a belly rub, so why not become a member today? What are PETstock Dollars and how do I earn them? Fur, feathers or fins…no matter which family member you shop for, you’ll earn rewards every time you purchase. PETstock Rewards members will earn $10 PETstock Dollars for every $500 spent on products and services at PETstock (the only exceptions are products eligible for Brand Cash, gift cards and pet adoption) And there will be more ways to earn rewards even faster … watch out for opportunities to earn DOUBLE and TRIPLE dollars! Do I receive Rewards for using PETstock Vet? What is Brand Cash and how do I earn it? Simply purchase any participating brand of premium food or flea, tick & worming treatments and you’ll be rewarded with 15% Brand Cash back on the purchase price directly into your PETstock Rewards account to use on your next purchase of that brand. What brands do I earn 15% Brand Cash back on every day? Flea, Tick and Worming treatment brands: Advantage, Advocate, Advantage, Broadline, Capstar, Comfortis, Comfortis Plus, Drontal, Frontline Plus, Milbemax, NexGard, NexGard Spectra, Pract-tic, Revolution, Seresto, Simparica. Do I earn rewards when a product is on sale? Yes, and you can even redeem your PETstock Dollars and Brand Cash when products are on promotion making them even better value! When do my PETstock Dollars and Brand Cash expire? PETstock Dollars will expire three months after the month in which they were earned, unless the member makes a purchase in that period whereby any PETstock Dollars will then carry forward for a maximum of 12 months. Premium food Brand Cash expires three months after the month in which it was earned. Flea, tick and worming Brand Cash expires three months after the month in which it was earned for three packs, or six months after the month in which it was earned for six packs. The purchase of two six packs as part of a specific promotion will activate a 12 month Brand Cash expiry period. Do I receive Rewards for using PETstock services? Absolutely! In fact, PETstock Rewards members earn triple PETstock Dollars on grooming services, puppy school and level one obedience training. I’m already a Family Values member. What happens to my existing dollars? As a valued Family Values Member, your membership details and dollars balance have been automatically moved across to the new PETstock Rewards loyalty program. So, welcome to the club!